A Cameron, in Grand Metropolis. Cameron (キャメロン) is an enemy that appears in Sonic Heroes. Their name is most likely derived from kame, the Japanese word for "turtle". They are found in Grand Metropolis, Power Plant (except Super Hard Mode, where all of them are Gold Camerons, Casino Park (except Team Rose), Bingo Highway and Frog Forest for all teams. In addition, they are found in Robot Carnival for all teams and in Robot Storm for Team Rose and Chaotix as well. 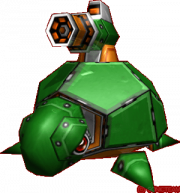 It resembles a large green turtle with a laser cannon mounted on the top of their shells. They are usually retracted back in their shells, but their heads and limbs will pop out once an enemy is spotted. Besides trying to face the enemy by rotating on their vertical axis, most of them will remain stationary otherwise, though some have move slowly around as well. Their laser gun is capable of firing circle-like pulse waves of some sort, and don't take long to recharge. As another plus to this model, they are able to withdraw back to their shells, mostly while in Power Formation or when a Tornado Attack is performed nearby. It has 6HP and rewards 200 points when destroyed, which can be done with either a power character or a speed character using a Tornado Jump to flip them on their backs (though a kick in the head works as well, but is much trickier). There is an advanced model, the Gold Cameron. This page was last edited on 27 October 2011, at 15:19.